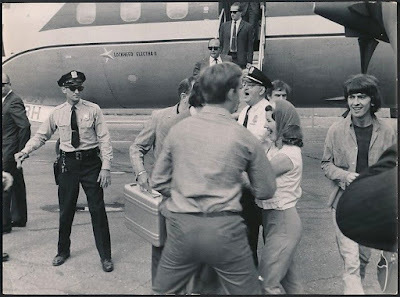 Meet the Beatles for Real: George is like, "I'm outta here!" George is like, "I'm outta here!" This picture is great! Lucky girl in the scarf -- I think that is Paul she is screaming to. August 21, 1965. Arriving at Minneapolis-Saint Paul International Airport, Minnesota.